Widely misrepresented in the West as a highly realized spiritual adept (if not an enlightened master) who has mastered the karmic process to the degree that they can consciously determine the circumstances of their rebirth, Dr. Alex Berzin provides a rare glimpse into this topic in his discussion of Guru Yoga. It is clear from the fact that tulkus must be re-educated, and the behaviour of some tulkus (although many tulkus are “proclaimed” for purely political reasons and are not actual tulkus, a different topic), that tulkus are not actual buddhas or even high lamas at all. This has led to considerable puzzlement in the West. In fact, according to Dr. Berzin, tulkus are a relatively lesser category of spiritual practitioner, certainly less than a lama – an overused title in the West – according to Dr. Berzin’s exposition, which is based on an impeccable mastery of the Tibetan tradition (Dr. Berzin is a master scholar-translator who has translated for HH the Dalai Lama and other high lamas and is a Buddhist practitioner in his own right). According to Dr. Berzin, one can even choose to become a tulku by fulfilling just four requirements. First, the aspiring tulku must have strong bodhicitta, i.e., striving towards awakening and compassion for the benefit of all sentient beings. In Dr. Berzin’s words, this pure intention must be “highly developed,” but by no means so much so that it becomes “uncontrived,” i.e., automatic and operative in all situations and circumstances, even when asleep. Second, and most importantly, the aspirant must have strong development of the generation stage of Anuttarayoga Tantra (see also Deity Yoga), but by no means must have completed (perfected) this stage. The generation stage involves self-identification with a yidam, or enlightened being, including “visualizations for the transformation of death, bardo, and rebirth,” what we might refer to more simply as the death-rebirth experience, or conscious dying. This attainment is certainly not insignificant, but on the other hand it is by no means the highest attainment either. I am not qualified to expand further on Dr. Berzin’s statements, but doubtless the earnest researcher should be able to find lots of information on this topic in English online and probably in print as well. Peter Harvey discusses this to some extent in his book, Introduction to Buddhism. Third, he or she must make continuous and strong prayers for continuing as a tulku into their next rebirth. Finally, fourth, they must have followers who are able and willing to look for and find them after they have passed away. A discussion of the technical procedures by which this is done exceeds the scope of this post, but involves the convergence of divinatory and astrological techniques; insights gained from dreams, visions and other paranormal phenomena; and other clues derived from the death of the future tulku as well as the tulku themselves both in this life and the next. By becoming a tulku one has in effect created a lineage of tulkus that can continue into the future. There are no other requirements. So, if you wish to be reborn as a tulku and establish your own lineage in subsequent lives, develop your bodhicitta, practise the appropriate visualizations, and pray. I am not aware of any other place where this information is available in English, so I am posting it here for those who may be interested. The link to Dr. Berzin’s discussion of this topic appears above. Incidentally, the child above is the current rebirth of Dudjom Rinpoche, the guru of Ngakpa Chogyam (a.k.a. Ngak’chang Rinpoche), the founder of Aro Buddhism in the West. 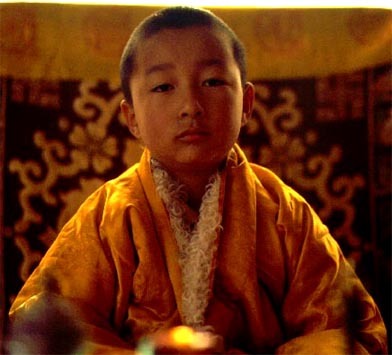 The process of discovering a tulku is documented in the film, Unmistaken Child (2008). Unfortunately, while the film is fascinating and beautifully made, the technical procedure by which the child is identified is not clearly explained, especially the astrological technique that involves a curious device. Why, for example, is the search limited to an area no larger than the distance that Tenzin Zopa, the young monk who searches for his now deceased teacher, can travel on foot in two years? Moreover, the process appears to be corrupt, in that Zopa appears to be influencing the final test, in which the child must choose objects that once belonged to the elderly lama, from among a selection, by actually pushing his hand towards certain objects (apparently the test was not conducted under double-blind conditions, another flaw in the process, since subtle cues by the investigators can also influence the result). This is unfortunate but of course does not vitiate the concept, only this particular case, but it demonstrates how the Tibetan system has become corrupted by time and politics. This problem is not new. The Dalai Lama himself has publicly acknowledged that only half of the historical Dalai Lamas were authentic, and complains that many tulku appointments are politically motivated. A much better depiction of the process of identifying and confirming a tulku is the film, The Reincarnation of Khensur Rinpoche (1992) (see below). What Do the Terms Rinpoche, Tulku and Khenpo Mean? Reginald A. Ray. Secret of the Vajra World: The Tantric Buddhism of Tibet, Vol. 2, Chapters 15-18 (Boston: Shambhala, 2001). This new information is not reflected in the blog yet.